Explore the natural beauty and embrace the thrilling adventures of Chile on a 10 day journey from the Desert to the Sea! Your experience begins in the raw and drastic landscapes of the Atacama Desert. Enjoy a few days here before heading to the charming capital city of Santiago. Admire the architecture, learn about the rich history. From there, continue on to Rapa Nui, Easter Island to dive deep into this unique island culture and beautiful landscapes mixed with ocean views. Your exploration will then guide you on a walk through the footsteps of ancient civilizations, as you uncover the mysteries of Easter Island, for the perfect ending to your adventure! Welcome to Chile! Upon arrival in Santiago airport, you will catch your flight to Calama. Here, a shared transfer will be waiting for you to take you to your hotel in San Pedro de Atacama. Casa Atacama welcomes you to enjoy the mystical landscapes, stunningly diverse scenery and exhilarating adventures of the world’s driest desert. Their professional tour guides plan excursions for all interests and skill levels, from trekking and biking to archaeological outings and cultural tours. After breakfast, a shared transfer will drive you to Calama airport where you will catch you domestic flight to Santiago. Arriving at Santiago airport a private transfer will be waiting for you to drive you to your hotel in Lastarria neighborhood. In the afternoon your private guide will pick you at your hotel to take you on a Half Day Santiago City Tour. 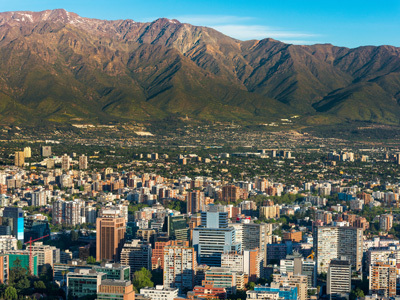 You will be shown the highlights of Chile’s capital city, such as the historical city center, the San Cristobal Hill and the Bellavista neighborhood. After breakfast, you will be collected from your hotel and taken to the airport in Santiago where you will catch your flight to Easter Island. Here you will be met by a shared transfer from Hare Noi who will take you to your hotel on the island. You will arrive in time to have lunch and enjoy an afternoon activity with the Hare Noi guides. Easter Island, also known by the name "Rapa Nui" in the local language, is located in the southeastern Pacific Ocean. This small island is one of the most isolated places on Earth and most famous for its fascinating 887 monumental statues, called "moai". The huge statues are scattered throughout the 15 mile long island, literally creating an open air museum. While you're not busy exploring the statues in disbelief, the island also features fabulous beaches for diving, snorkeling and surfing, offering opportunity for adventure in every way. You will have 2 full days to enjoy Hare Noi and the wonderful all-inclusive shared excursions they offer. Recognized as a UNESCO World Heritage Site, Easter Island’s fascinating archeology and culture have sparked the curiosity of travelers from all over the world. With a secluded location 3,500 kilometers from the coast of South America and over 2,000 miles from the nearest inhabited island, Easter Island is one of the most remote places on Earth. The native Rapa Nui inhabitants have developed a rich cultural history here over the last 1,000 years. The ancient islanders are best known for their mysterious moai – monolithic human figures carved from stone – which can be seen on platforms around the island’s perimeter. Hare Noi offers numerous excursions to help visitors make the most of their time on this fascinating volcanic island. According to your flight schedule, a regular transfer will drive you to Mataveri airport in Easter Island to catch your flight back to Santiago. Upon arrival, a private transfer will be waiting for you to drive you to The Magnolia Hotel to enjoy your last night in Chile. Although your adventure must come to an end today, you will be leaving with new friends, amazing experiences and memories to cherish for the rest of your life. Once you have checked out of your hotel in Santiago, you will be met by your driver and transferred to the airport in good time to board your international departure flight. Casa Atacama is located at the heart of San Pedro de Atacama and provides an oasis of calm and intimacy for those looking to unwind after a trek or simply to enjoy being away from it all. The décor is minimalistic and chic, while still preserving a genuine, local ambience with small artefacts and vivid detail. The 25 bedrooms are spacious and offer private inside gardens and terraces. Sustainability is a priority in this remarkable hotel through the use of solar panels for heating and light, as well as ecological facilities. The excursions are conducted in small groups and are tailored to suit different interests and fitness levels, with over 40 desert experiences to choose from. The Spa offers massages, reiki and reflexology, a sauna, an outdoor swimming pool and a Jacuzzi, all set in a wonderfully peaceful, natural environment. Hare Noi is located in one of the most exotic destinations of our country: Easter Island. Myth and reality merge in a unique landscape, in which both nature and energy of a culture like no other, give life to the most remote inhabited island in the world. 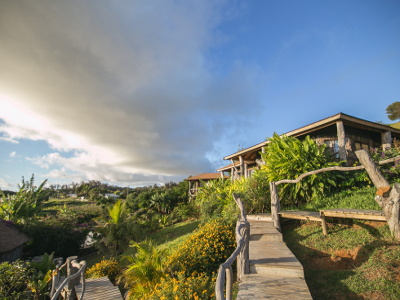 Located 7 minutes from town and with a stunning view of the Rano Kau volcano, the hotel also offers a panoramic view of bay Hanga Roa o Tai and spectacular and exclusive excursions that will make guests to immerse themselves in the history of a unique place filled with ancestral traditions and customs.